Nymph Fishing, A History of The Art and Practice, was the first book on this important and often controversial aspect of fly fishing for trout. Over the last few years, a new breed of angling writers has emerged on the scene, who handle weighty historical matters with a light touch. Andrew Herd's The Fly is a classic example; Hayter's account of F.M. Halford and the Dry fly Revolution, though more traditionally academic, is another. Painstaking research, factual accuracy and new insights are counterbalanced by lightness of style, resulting in easy reading. 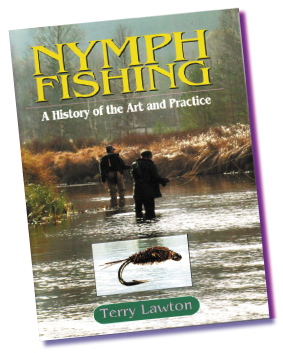 Now another author has joined their ranks, with a comprehensive work on the popular subject of nymph fishing. The book is illustrated with excellent photos, ancient and modern, and Lawton has expended much effort in tracking down new shots of familiar faces, Sawyer, Kite and Schwiebert, as well as presenting images of less well-known figures like Wigram, Trueblood and "Polly" Rosborough. There is no shortage of pictures of flies and there are some charming illustrations of nymphs drawn by Sawyer himself. This is a work of major importance, the most comprehensive and thorough treatment of the subject to date, and a delightful and thought-provoking read. It is certain to become a definitive reference book and no serious fly-fisherman can afford to be without a copy on his book shelves. You will soon be able to buy this book in French. Click here to find out more. 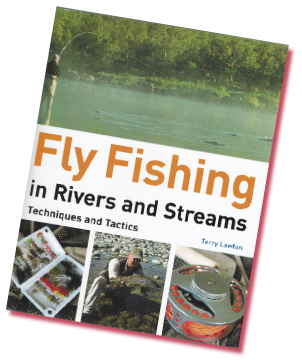 Fly Fishing in Rivers and Streams, Techniques and Tactics was published in hardback by New Holland Publishers in May 2007. It is a fully illustrated book which presents a practical approach to very important, but often neglected, practical aspects of fly fishing on rivers and streams: streamcraft. Newcomers to fly fishing who may start by going on a short course, or having some casting lessons, and those who do not have the benefit of an experienced friend to 'show them the ropes' can spend a lot of time frightening fish, hooking and then losing fish because they lack any knowledge of streamcraft. Fly Fishing in Rivers and Streams is about selecting the right equipment for different sizes and types of river and stream, approaching the river and fishing like a hunter, recommending tactics for catching fish and, when you have caught a fish, how to play it and land or release it. The book ends with a discussion of the delights of being on a river bank for the thoughtful angler who is interested in more than simply catching fish. It is a book for thinking anglers who are looking for a new strategy or a new sense of direction for their fishing It will encourage anglers to stop and think first, and look and see what is happening on the river. Note: Unfortunately the English edition of this book is out of print but copies are available occasionally from leading second-hand fishing book dealers. Even if the title of this volume seems slightly laboured, it is about "Trout-Takers" - flies with proven track records from around the world, and which very often are transferable to waters other than those of their origin. Terry Lawton is a keen and deep researcher - as I know from watching him delve in my own library - and I am delighted to write a few words about this, his third book He seeks to track down, by contacting folk, as much direct information as he can. This was evident in his Nymph Fishing - a History of its Art and Practice (2005) and Fly Fishing in Rivers and Streams- Techniques and Tactics (2007). Now he tells us about 51 fly patterns - Dry 23, Nymph 20 and Wet and Streamers 8 - that we ought to have in our fly boxes. He takes us on a global journey taking in a dozen countries - Argentina, Australia, Denmark, England, Finland, Holland, New Zealand, Northern Ireland, Slovenia, South Africa, Sweden and the U.S.A. - with patterns from the Adams to the Zug Bug. Some of these you may know, but there are certainly some you won't - and I didn't. Whilst there are no step-by-step tying instructions (available in other publications) Terry gives us some tying hints and thoughts on how these flies are to be fished. Anyone bold enough to offer the 'origins' of a fly pattern will from time to time find themselves faced with conflicting accounts - and claimants. Often this arises because a pattern becomes more associated in the public mind with the populariser rather than its originator. Not all evidence is crystal clear, sometimes like a jigsaw with linking pieces missing, as when, for example trying to distinguish across the mists of time between the original innovative creator of a fly or a subsequent varyier, developer, publicist or populariser. To untangle the truth from 'myth' on occasion makes the writer wish for the wisdom of Solomon! All one can do is review the historical evidence available and come down on one side or the other. Then there are identical or similar creations by tiers miles apart and unbeknownst to each other. For example, Oliver Kite's Imperial, in the form that we know it, is generally accepted as being created by him on Wales' River Teifi in 1962. However, a friend of Kite, fishing the River Doubs in France, subsequently encountered an old peasant angler with a fly-box 'crammed full of Imperials', who when shown a Kite Imperial simply remarked that he had been making such a fly himself since 1950. Will these 'trout-takers' be viewed in years to come as 'timeless ties'? Take them out and try them - you decide! No doubt you will favour some more than others for, as Charles Hallock truthfully noted, 'favourite flies are more apt to be the favourites of the anglers themselves than of the fish they are in quest of.' Yet William Lunn encourages us with the observation that 'the proper fly, properly presented, at the proper time, generally brings forth the proper result.' Then, as with the reply to Lewis B. France's question 'Judge,can you tie a fly ? ', you may respond 'Not very well; but I will some day, and then I'll make the trout round here think they are eating candy.' True 'Trout Takers' have that effect.